Princess Shokora is a character who once reigned over an unspecified country and was buried long ago within a Golden Pyramid. She appears only within Wario Land 4 and its related literary media, such as one volume of the Japanese Super Mario-Kun manga. When Wario learns about the recently discovered Golden Pyramid, he has the intention of stealing Shokora's treasure for himself, unaware that the Black Cat who has been guiding him throughout the game is actually Shokora herself, cursed by the Golden Diva. Princess Shokora also takes on a form as the Item Shopkeeper, providing objects and antagonistic transformations which deal damage to the game's bosses. Like many Mario and Wario characters, Shokora's name comes from a food product: "Shokora" is a Japanese approximation of the French word "chocolat". Long ago, Princess Shokora was a princess of a king who ruled over the country in which the game takes place. She rested peacefully within the Golden Pyramid, until it became occupied by a greedy and power-hungry villain known as the Golden Diva, who placed a curse on Shokora. After rumors emerged about the buried pyramid's existence, its ruins were soon excavated and explored by archaeologists, most notably Arewo Shitain-hakase. All forms of Princess Shokora seen in the game. Sometime before the events of the game, Shokora had been transformed into a Black Cat, although still possessing her human mind. She is seen in the very beginning of the game's opening cut-scene, residing in a dirty alleyway in her cat form. She is soon shown crossing a city street, whilst Wario speeds over her in his Wario Car. This causes a newspaper to fly into her face, which she begins to read. The front page shows an article about the discovery of the pyramid where Shokora once rested. The article also shows a small portrait of Shokora. Throughout the game, the Black Cat acts somewhat as a guide to Wario. In the room before each passage's boss, the Black Cat can be seen running into the Item Shop, transforming into the Item Shopkeeper before Wario enters. This form of Princess Shokora can also be seen on the walls of the Hall of Hieroglyphs, which provide tutorials on how to use Wario's various moves and attacks. Princess Shokora in her shopkeeper form can be seen in the game's Sound Room, where some animated images of her can be seen when playing some CDs. She can also sometimes be seen on the game's main map in her cat form. If Wario purchases certain items from the Item Shop to use against the final boss, the Golden Diva, the player can see the Item Shopkeeper transforming back into the Black Cat. At the beginning of the Golden Diva battle, the Black Cat scratches the Golden Diva's face. Unaffected, the Diva uses magic to absorb her. When the Diva's Lips are defeated, the Black Cat emerges, and she escapes with Wario from the crumbling pyramid. The true form of Princess Shokora is revealed after all twelve treasure chests are collected. After the pyramid crumbles, the four pieces of jewelry that Wario collected from the game's bosses are returned to the Black Cat, causing her to transform into her human form. 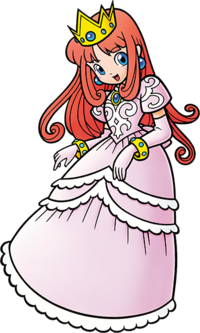 Princess Shokora's appearance is dependent on the number of treasure chests collected by Wario from the pyramid. If one or no chests were collected, then Princess Shokora appears as a young, bratty toddler. If two to five chests were collected, Shokora appears as a large, unattractive woman with a big nose, resembling Wario. If six to eleven chests were collected, Shokora takes the appearance of a young woman with long hair. If all twelve treasure chests are collected, Shokora's true form is shown, as a slender and matured woman with shorter hair. Regardless of which form she takes, Princess Shokora kisses Wario on the cheek and says, "Thank you, Wario...♥" Four cherubim with halos lift her into the air, and Shokora then disappears into the sky. The form that Princess Shokora takes when collecting six to eleven treasure chests most resembles her official artwork and her portrait seen in the opening cutscene. The form that she takes after collecting all twelve treasure chests appears to be an adult version of her. Princess Shokora appears in volume 28 of Super Mario-Kun. Princess Shokora reappears in Super Smash Bros. Ultimate as a Novice-class support spirit, equipping the fighter with a Super Leaf upon use. In the spirit's battle, the player has to defeat Princess Peach on the Mushroom Kingdom II stage. The opponent is accompanied by Wario and Mr. Game & Watch, the latter referencing Princess Shokora's shopkeeper form. Princess Shokora's core can be combined with Wanda's core to summon the Sprixie Princesses' spirit. Mushroom Kingdom II Ruins - Wario Land: Shake It! For this subject's image gallery, see Gallery:Princess Shokora. Princess Shokora - Shokora's theme (without in-game sound effects), heard during the closing sequence. Princess Shokora - Shokora's theme, with several sound effects present. Princess Shokora - Music heard in Shokora's Item Shop. "According to the article, the ruins appear to be the pyramid of the sleeping princess of the king who reigned over the area long ago, [which] had been captured/occupied and cursed by the arrogant and selfish golden dead person, Yōki [the Golden Diva]. "Long ago she was the princess of a country, [she] was sleeping peacefully in the Golden Pyramid, but the pyramid became occupied by the villain Yōki [the Golden Diva]." "When I read the article, I learned that the ruins held the buried pyramid where the princess Shokora, who once ruled this area, had been put into a cursed sleep by the arrogant, selfish, money-crazed Golden Diva." This page was last edited on April 8, 2019, at 17:34.